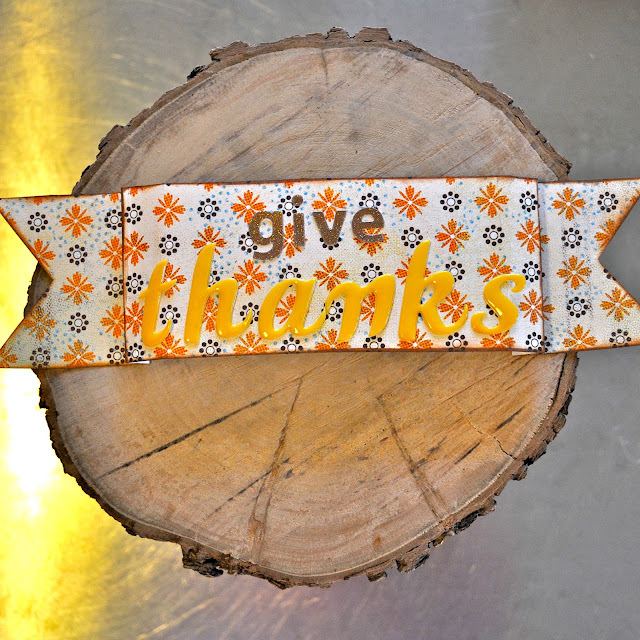 I’m so excited to share with you how to make this easy DIY fall Thanksgiving wreath! I whipped it up yesterday morning in under two hours from start to finish, less time than it took the kids to watch Star Wars. 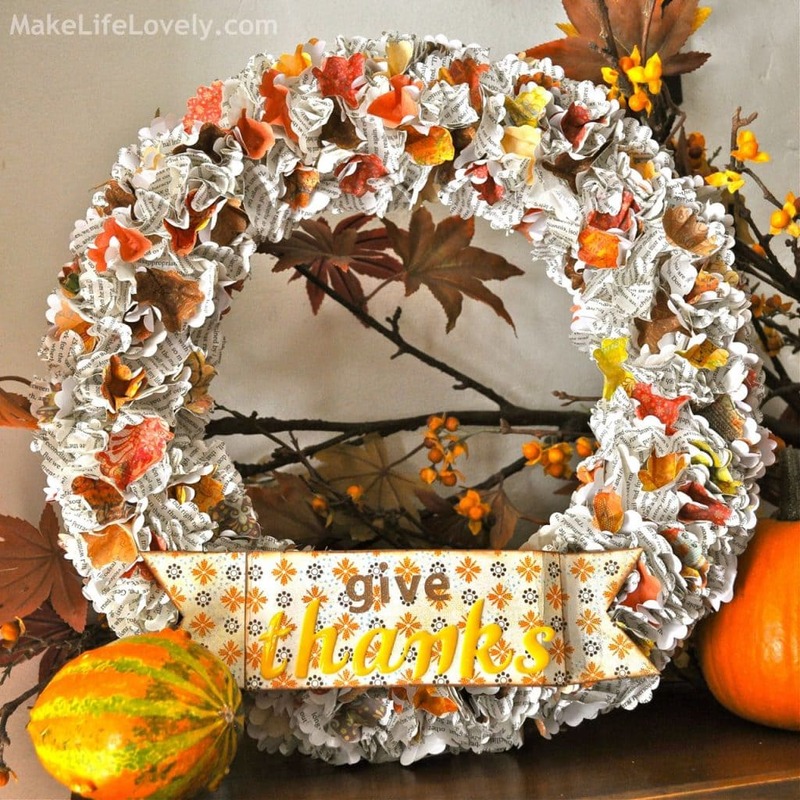 This Thanksgiving wreath is really easy to make, is made from punched paper, and cost me only $2.50 to make. Follow the simple directions below to make your own pretty wreath! Step 1. Get punching! 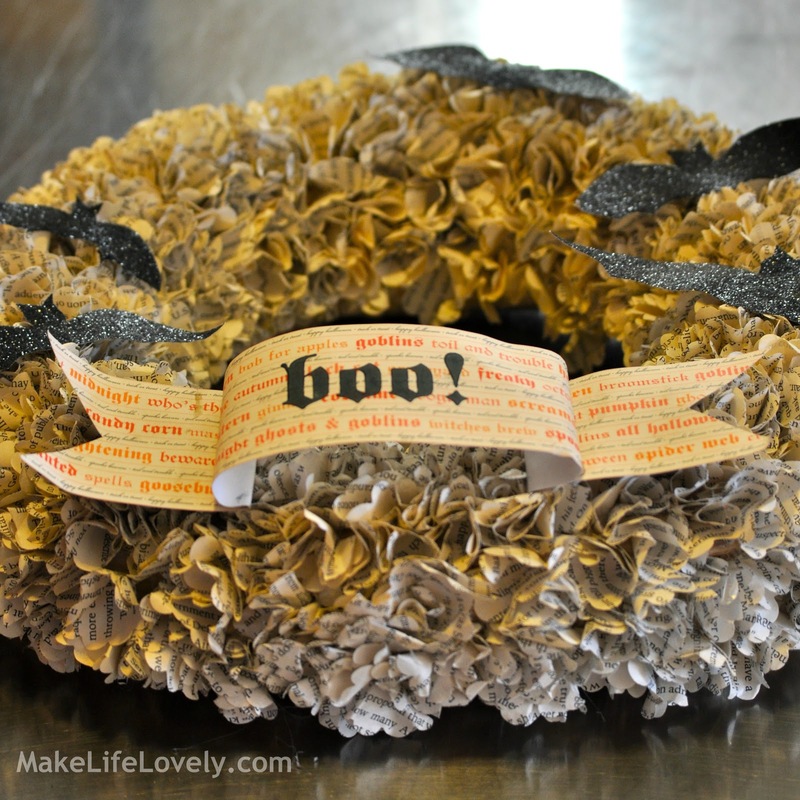 I punched my paper for this wreath with a scalloped circle punch, but you could also use a regular circle punch. The scalloped paper with words on it were from a book I bought at the dollar store. Step 2. Remember making those tissue paper art projects way back in kindergarten? You’re going to be using that same technique to make this wreath. First, take one of your punched circles, and wrap it up and around the eraser end of your pencil. 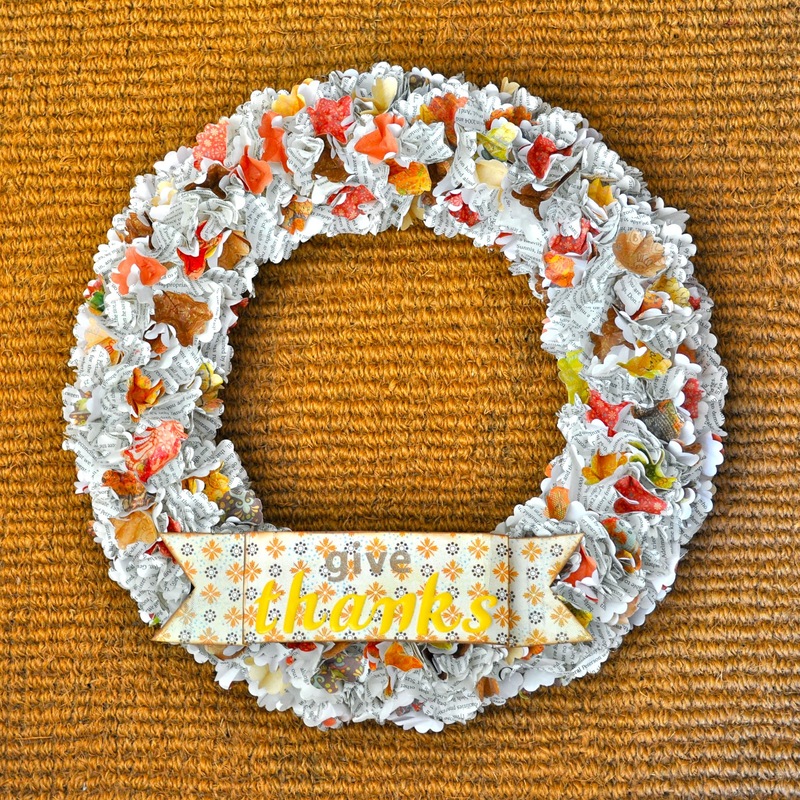 Next, use your glue gun to put some glue on your wreath, and quickly stick your scrunched up circle onto the wreath. Push it in with the pencil eraser and wiggle it around a little. Repeat with more circles, mixing up the book circles and patterned colorful circles. Now step back and admire your lovely wreath! Look at it from all angles, and make sure that you can’t see any of the wreath when it is hanging up. I left the back bare so the wreath can lay flat. Step 3. Now your wreath is all full and beautiful, but it looks a little plain, don’t you think? Let’s make a little banner for the bottom. I just took a strip of patterned paper, folded it, cut the ends, and added scrapbook letters to the top. If you don’t have letters, or don’t want to buy any, you could also use a stamp, or put the patterned paper straight into your printer and print your banner. Be creative!! My banner needed a little something more to make it stand out, so I took a brown ink pad and rubbed it along the edges to give them a little definition. And if you have some time before Halloween, or want to get a head start on your Halloween decorations for next year, you can also use this same technique to create an adorable Halloween wreath, like this one. I made this one last year, and it’s still in perfect condition this year! I cut out bats from black glitter paper, and used Halloween paper to make the banner. I stamped the word “boo!”with some Martha Stewart Halloween stamps, but you could print it on using your printer just as easily if you don’t own any stamps. I hope you try making one of these wreaths! You might also like my Metallic Golden Acorns, this adorable Boy’s Thanksgiving Pilgrim Hat, and this easy DIY fall headband (for boys or girls). Thanks Rose! So glad you stopped by too. You don’t have to be crafty to make this wreath. Even so, I’ve seen your cute little baby cupcakes that you make, so I know you are very crafty 😉 My four year old helped me stick the paper on, so anyone can do this! oh I so love this!!!!! Love it…I’ve been looking forward to the debut, and it didn’t disappoint! Oh good, so happy to hear it Whitney! Thanks for stopping by. Would this work with book or magazine pages or does it need to be thicker paper, like a book? It should still work with book or magazine pages, but I recommend using the book pages because it will hold up better if you plan on keeping the wreath for a few years. I just bought a cheap book at the dollar store that I didn’t mind cutting up. I also made one last year, and it is in perfect condition this year! For any of us(like me) who are craft challenged, can you explain or show a single punched circle? Don’t know anything about/have never used a punch circle cutter. So I was lost at step 1! Sorry! You can find them at any craft store (Michael’s, Joannes, Hobby Lobby, etc. ), and you can use a scalloped edge circle punch or regular circle punch for this project. The punch I used was almost 2″ diameter, but anything close to that would work. Hope this helps. Good luck! That is really nice, now, if I only had a punch circle cutter. Thanks so much for sharing this, I can’t wait to make one! You are welcome, be sure to come back and let me know how it goes! Thanks for stopping by. Thanks Kat! I need to get started on a Christmas wreath, too. Thanks for the reminder, so glad you stopped by! Love this wreath! What size circle punch did you use on this! Thanks!! Good question, Sue! It was a scalloped paper punch that was almost 2″ in diameter. Hope that helps! I don’t know how you made it in only 2 hours! I have made one for Valentines day and Halloween and it always ends up taking me weeks to finish! They are well worth the effort though. I kind of get in a groove after I’ve been making them for a few minutes, and I work really fast. If someone tries to talk to me, though, I lose my concentration, and go much slower! 🙂 My first one took forever to make, but my second and third I definitely did in two hours. I tried not to worry about it looking “perfect,” and just go for it, and that made it go much faster. Yes, definitely worth the effort- so cute and inexpensive! Laura- I love how this wreath turned out! Such a great idea and I really like the overall look. 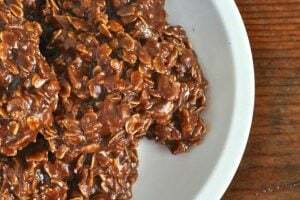 Can’t wait to make one for fall and halloween! I featured this on my blog today! Thanks for sharing such a cute wreath!! OMG this is amazing. I might need to make one for Christmas. I think it would look beautiful with red paper. 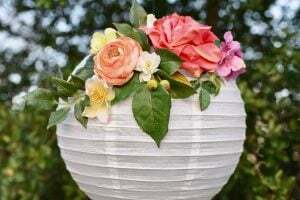 This is just so pretty and I was wondering how to make it. I saw a lady making one just like it at the last scrap camp but I had no ideal how big to make the circle etc. You have answered all my questions and I”m am going to make one tonight for Christmas with a Disney theme. Merry Christmas to you and your family. blog. 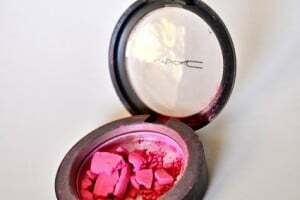 I am so delighted to become a member of make life lovely and be friends with you.